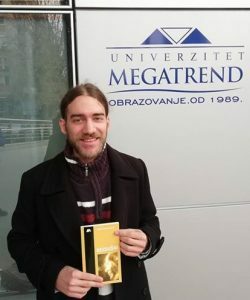 Stefan Sofronijević, a student of the Faculty of Culture and Media, Journalism, has just published a novel “Bezdusni”, published by Argus Books & Magazines. This is the fourth book of this very talented young author. Stefan Sofronijević was born in 1993 in Belgrade. He started writting during elementary school, and he published his first novel under the title “Samokorak” as a seventeen-year-old. His first debut was noticed by reviewers Petar V. Arbutin, Mile Acimovic Ivkov and Misa Lazar, who supported a young gifted author. In the meantime, he published novels “Zacarani krug” and “Eho mrtvog jezika”. Both of these novels came to a good reception and echo in the media. The first presentation of Sofronijevic’s newly published novel is expected these days.